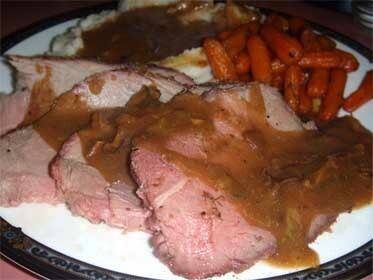 This is an easy recipe for cooking a Roast Beef. The key is to cook it at a low temperature. I cook this at 275 degrees, for a nice, tender roast. 1. Pre-heat the oven to 500 degrees. Begin by first, washing the roast, then trimming it. This piece had "silver skin" just underneath a thin layer, so I removed it, then any other grizzle that was noticeable. 2. Season the meat with plenty of SteakHouse Seasoning and Coarse Kosher Salt, then oil it well to help the spices stay on. 3. Place the roast on a rack in a 2" deep pan. Cook for 15 nminutes at 500 degrees, then turn the temperature down to 275 without opening the door. 4. Cook the roast until an instant read meat thermometer inserted into the center of the roast registers 115 - 120 degrees, for rare. This will take 2 1/2 - 3 hours at the 275 cooking temperature. Total time depends upon the thickness of the meat, and the exact temperature of your oven. When the roast is done, place it on a platter, cover it with aluminum foil, and let it rest at least 20 minutes. During the high heat of cooking, the moisture within the meat is drawn to the outside of the roast, where the heat is the highest. Letting the roast rest, gives the moisture time to be redistributed within the entire roast. If you don't let it rest, you'll end up with dry meat, because all of the juices will run out as you carve it. 5. While the meat is resting, you can use the drippings from the pan, to make a gravy.